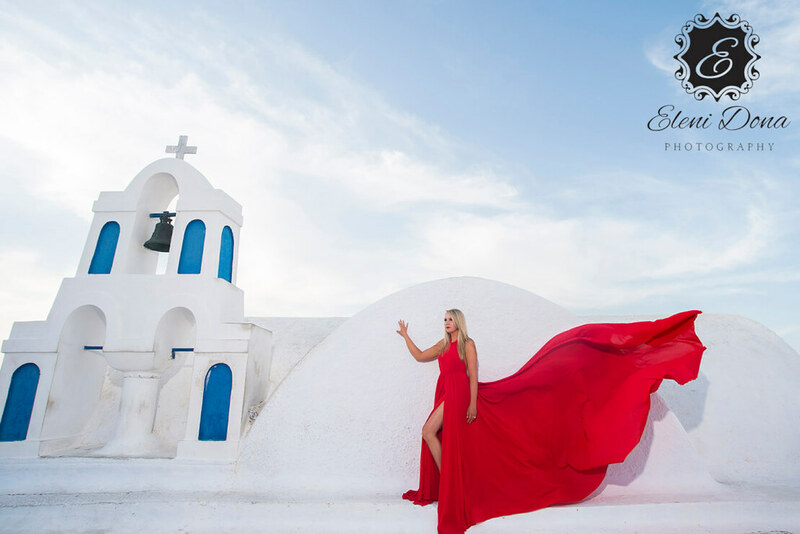 Have you considered a winter wedding in Greece? 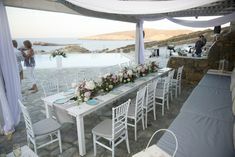 Or even better, how about a Christmas wedding with a view of the Acropolis? 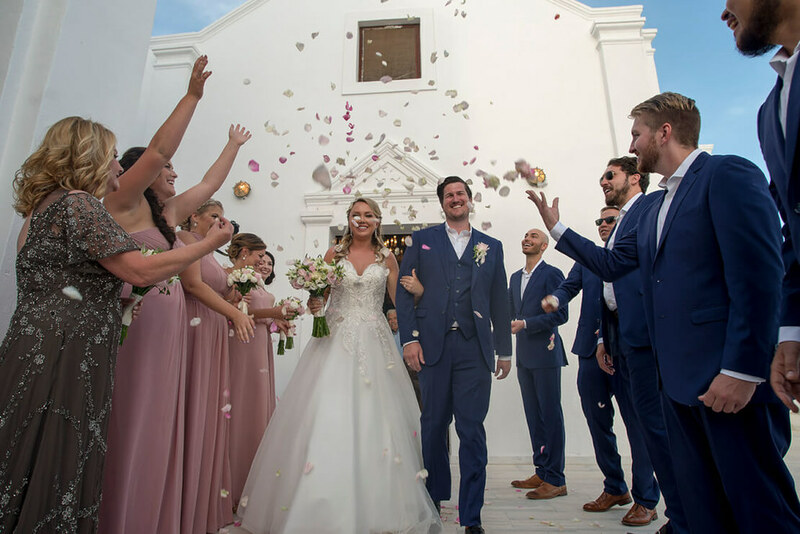 Jen and Joe against all odds opt for an exquisite wedding in Athens during Christmas time and they were more than justified for their choice! After all, Christmas is one of the most romantic periods of the year. Greece is not only a great summer destination, but also offers plenty of extraordinary alternatives for winter weddings. Athens could not fit more for the occasion. Especially during Christmas time, when like every other metropolis, is adorned with jolly lights and festive decorations. Christmas markets are cropping up and themed cafes and pubs make you wish you could freeze time at this exact moment. 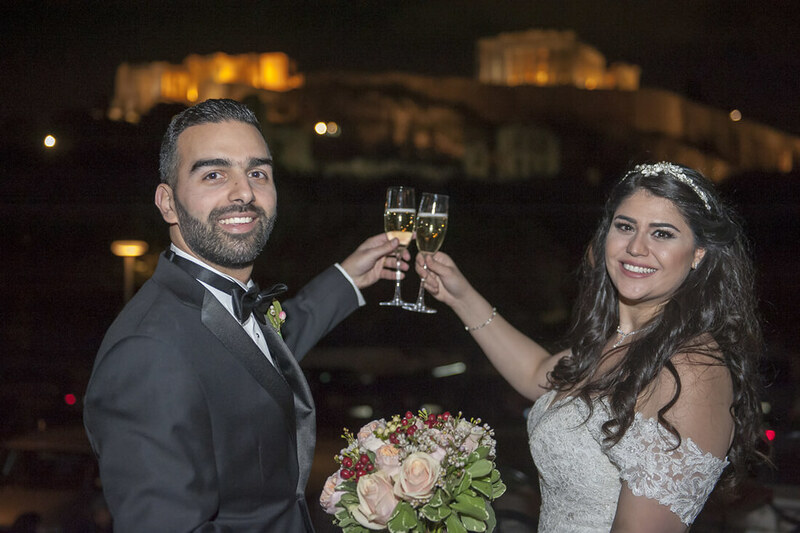 Jen & Joe, our lovely couple from Lebanon, pick the classic elegance of Grande Bretagne hotel to be the starting point of their big day. 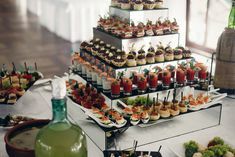 In the comfort of two luxurious suites, bride and groom with the minimum of anxious enjoyed the pampering from the beauty experts and the joyful teasing of their friends. 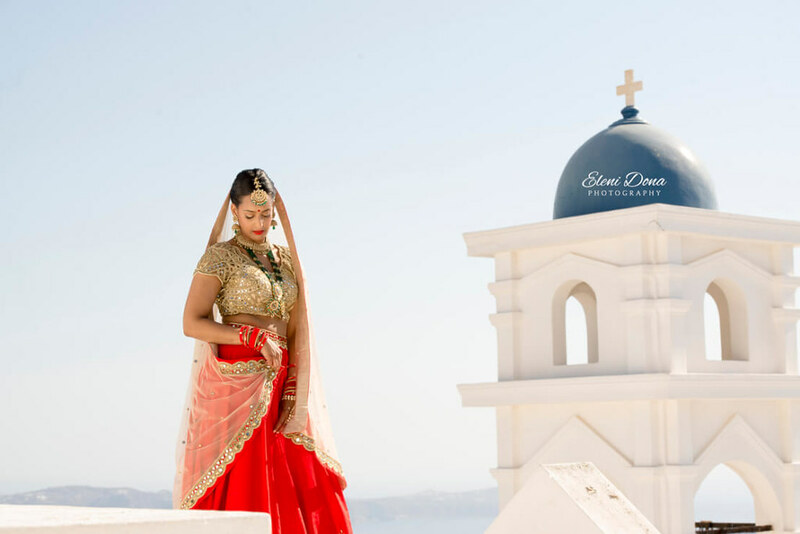 Being one of the most regal and old hotels in Athens, Grande Bretagne set the perfect royal background for some glorious pre-wedding photos for our blissful bride. And just like that, the journey of an Arab wedding in Greece begins! Their Maronite wedding ceremony took place in Agios Dionysios Areopagitis Catholic Cathedral, an imposing church in the center of Athens. The decoration was simple as the interior of the cathedral is enough impressive as it is. The only holiday influenced bouquets of pale pink roses with mistletoe added the festive Christmas touch of the wedding and highlighted the edges of the aisle. 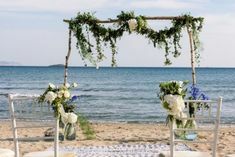 Statement florals and rose petals on the red carpet isle was the romantic addition which uplifted the arrival of the couple to the altar. Jen in her all lace mermaid wedding dress with the impressive long veil played the “late bride” card and made Joe even more eager to see her. The wedding ceremony was performed by our Lebanese Maronite priest in the Arab language. The holiday wintry style of this wedding was present in every inch of the reception venue. Zonar’s restaurant is one of the most historical spots in Athens with a magnificent Acropolis view. Ethereal snowflakes, subdued purple lights and lush rose centerpieces with jolly mistletoe, were the essential elements which made this winter wedding a holiday model for inspiration. The crepuscular light of burning candles was caressing perfectly our decoration adding a hint of romance. 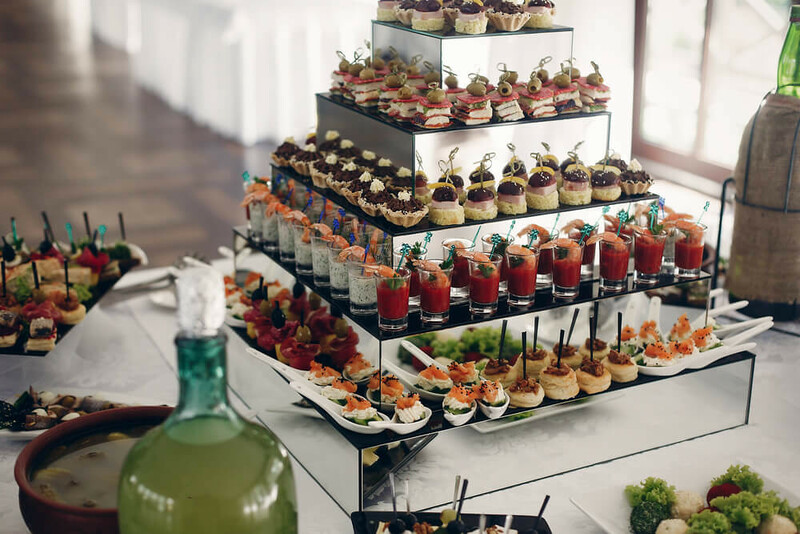 Various sweets and treats in ivory and pink tones were overwhelming the candy station and feasting our eyes. The Cocktail bar, the saxophonist, the twinkling lights, all created the utter celebratory atmosphere and foreshadowed a delirious party. The most mystical moment of the night, the first dance of Jen and Joe in a cloud of mist, under the floating snowflakes and with the lit Parthenon in the background was heart-winning. Like a scene from a romantic movie jumped into real life. And then the party started. And oh what party was that! One of the craziest, most joyful wedding parties we were lucky enough to witness. Guests and family from Lebanon, USA and Dubai was dancing to the Lebanese and international music and had the fun of their lives. The reception went on until the first morning hours. Jen and Joe’s wedding was truly an inspiration. Their winter love celebration warms up the cold days in the Christmassy Athens. Interested in booking a wedding planner experienced in Lebanese Maronite weddings? 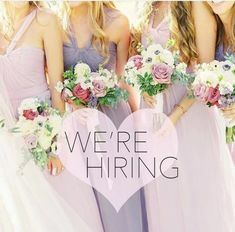 Send us now an email by filling the contact form here.